In the summer of 2009, our comfy but crappily-constructed Ikea couch was not merely bedraggled beyond belief, but the frame had actually snapped right in two, after just a few years of normal wear. We needed to replace it, and I was tired of churning through shoddy sofas. This time, Jak and I wanted to get something sturdy and attractive that would hold up for twenty years or more. We fully intended to buy used, but I combed Craigslist ads for nearly a year without success. The quality sofas were almost as expensive as buying new, but weren’t the look we wanted. The cheaper stuff was all either ugly or shoddy or both. Eventually we started looking at new furniture, which ultimately led us to standing in Macy’s in June 2010 during a One Day Sale, preparing to lay down almost $2400, including tax and delivery, on a new matching leather sofa and loveseat. That was a lot of money for us. These two pieces of furniture would be the second- and third-most-expensive things we owned, after our eleven-year-old car. The cost would be worth it, if they lasted us for several decades. I’d done my research into furniture construction, so I could tell these pieces were well-made. The only problem: our aforementioned Bad Cat. Sammy had shown a preference for expressing his anxiety on highly absorbent areas — beds, upholstered couches, baskets of laundry — and we had some hope that the leather wouldn’t qualify. But it was a heck of a risk to take. So when the salesman started talking up Macy’s ‘Worry No More’ furniture insurance, I actually read the brochure and gave it some consideration. Normally, I just say ‘no thanks, not interested’ when someone starts trying to sell me an extended warranty, mostly because I’d been reading Consumer Reports’ warnings against them for the last twenty years. In this case, my wariness was offset by my fear that we might be buying a $2400 pair of cat toilets. The insurance plan was good for seven years, and promised ‘professional stain removal and furniture repair’ for covered accidents — or replacement if it couldn’t be cleaned or repaired. There were a lot of exclusions, including damage done by animal ‘teeth, beaks, and claws’. But for our purposes, that was okay — for all his faults, Sammy has never been a furniture-scratcher. It covered the one thing I was really worried about: ‘pet bodily fluids’ on leather. I went over the details with a fine-toothed comb. Some of the traps were clear — for example, you have to report the accident within ten days. It was expensive — close to $400 extra for accident coverage on both pieces. But I figured that seven years of professional leather cleaning might be worth that much. And if by some miracle we didn’t ever need to make a claim, we’d have a $400 credit at Macy’s in seven years. In the end, it looked like this insurance would substantially limit our Bad Cat risk. And so I took the bait. To no one’s surprise, the day eventually came when we discovered a puddle in the middle of our loveseat. We mopped it up and I called the warranty company. They don’t have repair staff of their own, but subcontract to local providers. So a day or two later, an unaffiliated upholstery cleaning professional showed up at our house, checked out the loveseat, and called the warranty company and made his report. Then he handed the phone to me. The Worry No More representative informed me that this event was not covered under the warranty, because ‘stain removal’ refers only to visible discoloration, not odor. As anyone with a Bad Cat knows from long experience, urine doesn’t typically leave a visible stain — the odor is the main problem. They never intended ‘pet bodily fluids’ to cover urine at all; I had fallen into a deliberate trap. 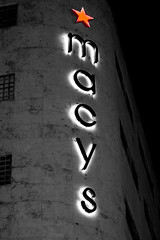 And of course now that I’d attempted a claim, even though it was denied, we lost our $400 Macy’s credit. To say that I was angry would not have begun to cover it. But I was also chagrined, because I should have expected as much. I felt half-responsible for letting myself believe a sales pitch for an extended warranty when I’d read, over and over again, that they were invariably a terrible deal for the buyer. I’d ignored the warnings, and been played for a sucker. A search online for “macy’s worry no more review” turns up hundreds upon hundreds of people on multiple sites complaining that the whole thing is a scam. The list of reasons for which people’s claims have been denied is absurdly long and so varied that it’s obviously indicative of overall policy. The business model here is to sell ‘insurance’ with no intent of ever paying out on a claim. Clearly, the business model here is to sell ‘insurance’ at hundreds of dollars per item with no intent of ever paying out on a claim. All income + no outgo = profit. Even worse, I saw one comment from a former Macy’s furniture salesperson explaining that the company mandates that 50% of each employee’s sales include these scam extended warranties, or you will be fired. Interestingly — and believably enough — he claims that Macy’s keeps the entire revenue, and simply contracts out to a separate company to handle the paperwork of denying claims. There is a happy ending to this story, although the credit is entirely due to the local upholstery cleaner who came out on the warranty call, and not Macy’s or the company behind ‘Worry No More’. Jon-Don Janitorial Supplies makes a product called Bad Dog. It’s a concentrated hydrogen peroxide-based liquid for removing pet urine odors. Use a syringe to inject this antidote directly into the foam cushion where the urine has penetrated. If the odor isn’t completely gone in a few hours, there’s a pocket where the peroxide didn’t reach — find the area and reapply. Seriously, magic. Over the years we’ve tried pretty much every commercial ‘enzyme cleaner’ product on the market — Nature’s Miracle, Simple Solution, and so on — along with every home remedy you’ve ever heard of. This puts all of them to shame. 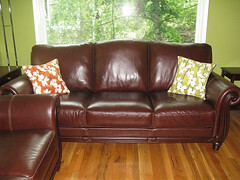 We’ve used it to remove urine odor from leather, upholstery, mattresses, and carpet. The peroxide is much more concentrated than what you buy at the drugstore — it will fast-bleach your hair and kill the outside layers of your skin, so be careful about getting it on yourself. But small quantities had no negative effects on the leather surface of our couches, or anything else we’ve treated with it. If you don’t live near one of Jon-Don’s warehouse stores, you can order Bad Dog online and have it shipped, along with a carpet syringe. Learn from my wasted $400: do not buy extended warranties or supplemental insurance on your purchases. Ever. If you are nervous about damage — if you have your own Bad Cat or Small Child or something else that makes accidents likely — then before you buy anything, call up a few local businesses and find out what the cost of repair or cleaning would be. Make sure you’re comfortable with adding that kind of expense to the lifetime cost of the item. Or purchase from a company that offers an unconditional money-back guarantee on its products with no extra charge — a company that’s more interested in your long-term loyalty than in short-term gain. Costco, for example, will take furniture back for a full refund at any time for any reason. Got a pet urine problem? Appreciate the warning against extended warranties? If you found this article helpful, consider leaving a tip on your way out — just click the little green button below and donate whatever you’d like. Thanks! Thanks for sharing your story. Unfortunately, I already paid for an extended warranty on a set of nice living room furniture (back in 2010), with the expectation that someone would spill red wine at some point. Hasn’t happened yet. Even though you mention that the hydrogen peroxide mix in Bad Dog is very concentrated, their website says it’s okay to put it undiluted on carpet, so it can’t be all that bad. I just meant that Bad Dog is much stronger than the 3% stuff you get at the drugstore, and you should avoid contact with skin or hair as much as possible, and wash it off quickly if you do get it on you. Neither leather nor natural or synthetic fibers have shown any damage on contact. I got both of my couches (similar to what you purchased) at Macy’s Furniture Outlet. That’s where they put stuff that’s been returned for any reason. I was *very* excited to find a matching couch and loveseat with only minor scratches on the back legs, running about $2000 for the pair. I also managed to get a nearly-matching couch that was a floor model. Lightly scuffed, but about 40% the cost of new. I’m not terribly unhappy with the base price we paid for the couches, just with the fake insurance they pushed at me. As always, great advice and information. We use Nature’s Miracle by the gallon, but still have odors. I’ll try the Bad Dog! Thank you. Welcome! Let me know if it works for you. yep, going thru the same crap (or pee) as FML did, but mine started when the “encasement” required along with the “warranty” I paid extra for. The warranty and bed encasement was supposed to cover urine accidents (as long as the “encasement/cover” was used – the website for the encasement company has a picture of old people and the word urine…anyone ever go to a SNIF/nursing home – urine smells get worse with medicine taking by elderly, not to mention fluids from bed sores…after a few phone calls and two visits to Macy’s store where I bought the $$$bed – NO WONDER THE SAME SALES MAN HAD THE LOOK OF HORROR ON HIS FACE!!!! But on my warrantee it says do not wash the spot – but they could not come out for a week – and thru the very very poor communications from the sub-contractor of the sub-contractor the day they were to inspect the bed – I was home, but I didn’t hear the door bell (think I was vacuuming under the bed) (after reading this I should of just left the dust bunnies) – and after reviewing the survalance cameras – the inspection person was there, pushed the door bell a couple times and left…since the sub-contractor of the sub-contractor lets say had difficulty with diction/speaking I kept the conversations to they talking. And since they seem so curd, felt let them do it their way first. Usually I have repair people call me first to announce their ETA of the day of the appointment. So, lets see if I can use the correct sub-contractor of the sub-contractor to RE-Set up the appointment. Then I will let you all know how the story ends. Like any insurance policy they will always tell you “it’s not covered” but the squeaky wheel gets the grease. Don’t take “no” for an answer. When they deny, then Appeal. If they deny your appeal, send a note to your state insurance complaint board and Macy’s CEO and cc them on both letters. Trust me this gets them moving. It is tiring but after 4 – 6 months of back and forth with worry no more /(Uniters Insurance) we have a new $2k couch on the way through Macys coming this May 2013. The thing that gets them is the rip in the seam. They can not fix this and Macy’s does not have replacement parts for them. If you have a stain, it is honestly better to use their fabric stain cleaner they provide on your own, it’s actually a solid stain cleaner. The sub contractors are usually local folks who aren’t as that professional. They were late to two appointments of ours and could not really get stains out. You have to have them come back 2x and try before Uniters “gives in” to the actual policy. 5 years ago they replaced a $500 couch very quickly once they saw a tear in the fabric. They can’t fix it! I am fighting with Uniters now to replace a cushion cover that is ripped. They denied it because they said material damage isn’t covered. That makes no sense to me so I’m going to keep fighting. It sounds like a rip is covered if they replaced your couch. My plan specifically excludes ‘failure or loosening of threads or separation of seams’—probably added it after you squeaked the wheel in 2013 :) See next post in 2014. I agree that Worry No More is a waste of money. We purchased the most expensive (supposedly best coverage) mattress protector for our son’s full size bed. The cover cost half of what the mattress cost! He has leaked through twice on the mattress right through the cover where we’ve had to call Worry No More to send someone out to clean it for us. It would have been more, but I put a crib waterproof cover under his sheet. Unfortunately that shifts sometimes and doesn’t cover where it needs to. We wasted our money on buying this cover to protect the mattress from urine stains….it doesn’t keep it from going through AT ALL. On top of that, when I called WNM to have the mattress cleaned I was told a service representative would contact me in 5-7 days….so the urine can set in completely and my 4 year old can sleep on the floor all week??!? …and that’s just to be contacted…who knows how long it will be until someone can come in to clean it. I want it cleaned today. SOOOO disappointed!!!! After finding this post I was so excited to learn about Bad Dog! We are experiencing the exact same thing with our cat peeing on our leather couch. Just received the product and ‘injected’ it into the cushions. Now, question: do I simply wait for it to dry? Should I wet vac it? Thank you!!! this warranty is a scam .,,,,, if u say over the damage occurred over time or over 15 days they will not service you . I brought a Lauren leather sofa a little over a year ago . I noticed the first damage 6 months ago, small damage. I Did not think anything of it. LATER 14 MONTHS OF OWNING THIS PIECE OF CRAP SOFA ,,,it is horrendous Unfortunately for me I do not always pull up the sofa to see what is going on inside … the day I called worry no more I saw the fabric attached to the leather cushions is basically coming apart// A 3000 DOLLAR SOFA …. BECAUSE I mentioned 6 months they refuse to repair . do not buy this warranty . In case anyone else stumbles across this board before submitting a claim to worrynomore/uniters, some people do have positive experiences! Our dog peed on our sectional couch (3 cushions and 2 throw pillows) purchased from Macy’s in Redmond, Washington in September 2013. I called worrynomore within 10 days of the date the stain occured (as it states on their Product Protection Plan) and had no trouble with the rep I spoke with. She took down my info and promised a tech would call within 48 hours to set up a site visit. The tech actuslly called within 4 hours. Unfortunately their next available appointment was in 2 weeks, but we told them we’d really like something sooner if possible. They must have had an opening because they were able to come out after only 1 week. The techs (with SAW, a third party cleaner contracted by worrynomore/uniters) were amazing. Incredibly friendly and professional. They got right to work and got the stains out. I do want to point out (because I read complaints elsewhere about urine stains) that our couch is dark gray in color and microfiber so it was difficult to see the stains after they dried. The techs had no issue with that! I can only comment on my own experience but i read the Product Protection Plan, followed the claim submission directions, made sure my claim was not part of the exclusions listed in the Product Protection Plan, was friendly and respectful of the technicians and customer service reps, and I had a good experience. And by “board” I meant blog post. Sorry. thank yoou for permitting me to comment! I purchased the WNM warranty….. DO NOT DO IT!!!!!! It is a scam, just as others have posted. Had tears in the seams if a leather sofa. When I called, they said it was normal wear and tear. My manufacturer’s warranty expired so it is not covered. When I called about a different hole, and told them my son accidentally punctured it , this time they said I waited too long to file the claim. The warranty cost $288 and is a joke! Take your money and save it for hiring somebody if a repair is needed. Oh, BTW, the $1500 sofa is a piece of crap too. I now have 4 holes in the sofa just from my son sitting on it. Total scam. I purchased a “WorryNoMore” protection plan at Bloomingdale’s for a sofa. Put in a claim and it took forever for them to schedule an appt with a tech to come out. He barely even LOOKED at the ink stain, just took a picture and told me that I should get a new cover. 4 months later, I learned that the sofa is discontinued and that they cannot replace the fabric. They offered to replace the sofa for the purchase (bought it on sale for $1600), but Bloomingdale’s doesn’t even sell ottomans for that price anymore. THINK TWICE… ASK QUESTIONS … This is a SCAM…TOTAL WASTE OF MONEY. Ugh…. my husband and I finally pulled the trigger on a beautiful Ralph Lauren leather couch and chair. All the photos online were of a gorgeous saddle colored leather. Of course, when we placed the order, there was a tiny box indicating the color that was actually available. Dark eggplant. i actually had a positive experience with macy’s extended warranty. they replaced a leather sofa without any problem after the frame cracked. thank goodness for the extended warranty because it was 4 years into ownership, way past the manufacturer’s warranty. Glad to hear about Macy’s unusually rapid response to a cracked frame! I just now came home to find the back of my 2015 $3ooo+ leather reclining sofa lying flat on the floor! The “solid wood frame” (now revealed to be cheesy fiber board)just cracked and crumbled apart, causing the the entire back structure, cushions, and all to separate from the base of the seat and flop “open” like a giant leather bound book! Such a peculiar sight, it took me a few beats to figure out what I was seeing. I thought maybe my two teenagers were rough-housing and landed on it just so. But they swear up and down they didn’t do it. They are lousy liars, and looked genuinely shocked at the scene as well, so I am pretty sure they are telling the truth. The only other possible culprit is the dog, but i can’t see how this smallish spaniel could cause such a catastrophic failure (or dogastrophic failure?). In any event it will be interesting to see if Macy’s and/or WorryNoMore try to weasel out of replacing the the entire couch. I will let ya’ll know! Приветствую вас, уважаемые пользователи ресурса. как поступить в ситуации — Мы вместе с любимым решили уехать на шоппинг на девять дней. так-как покупать у туристического оператора это проигрышный вариант, ведь так затратнее. В каких местах лучше посмотреть по теме авиабилеты флай кз ? I see your page needs some fresh & unique content. Writing manually is time consuming, but there is tool for this task. permission let me to seize your feed to stay updated with imminent post. I see your page needs some fresh & unique articles. My Eames lounge chair just broke at the arm rest. Damn, no warranty! This might be expensive to fix. . But I bought it 53 years ago, and it has sat and twirled three generations. Lesson: buy quality. Macy’s “Worry No More Insurance” is the worst and a complete sham. I think Macy’s furniture store and insurance company should be shut down. Honest hard working people throwing their money away. I bought a sofa and chair recliner and paid about $4000.00 out the door. It was the biggest waste of my money I ever spent. Junk beginning from the electrical equipment, frame, and leather deterioration. Unable to get “Worry No More” to even get back to us after filling out the forms and sending pictures and videos.